The moment a person begins to dream in a second language is often heralded as the moment he or she becomes fluent, when the brain stops translating a thought into a new idiom and instead pulls up a concept and expresses it in either tongue. Because language and dreams both connect the dreamer to culture, research suggests it’s also the point at which a person becomes comfortable straddling two worlds. Splashed across a pastel image of a globe, the words mean a number of deeply personal things to Noriega, whose daughters attend Mark Twain Dual Language Academy, where students are taught in a fully bilingual atmosphere. Noriega grew up in San Antonio in a sprawling Mexican-American family. She’s an artist whose work often melds current-day images with indigenous and Mexican-American iconography. Noriega has painted murals throughout the city that reach back to a time before the arrival of the Spanish conquistadores and depict the Latino customs of her own childhood. Two-thirds of San Antonio residents are Latino, but until recently, schools didn’t recognize bilingualism as a strength. Students were pushed to learn English as quickly as possible and speak it exclusively. Noriega’s father, Lionel Sosa, is now a nationally known marketing expert and political strategist. As a schoolboy in the city’s poorest neighborhood, he was punished — hit on the knuckles with a ruler — for speaking Spanish in school. Three years ago, when the new superintendent of the San Antonio Independent School District, Pedro Martinez, decided to revitalize the struggling system by creating a portfolio of innovative schools and integrating them by family income, he knew that given the history of the city’s Latino residents, dual language schools would prove popular. And he knew bilingual education offers significant advantages in terms of both academics and career options for graduates. Cristina Noriega’s history with regard to language is a common one. Sosa wanted his children to be bilingual, and the oldest ones are. But by the time she was growing up, English was well established as the family’s common tongue. When Noriega got to college — she graduated from Yale University — she was astonished to meet students who could shift effortlessly from one language to another. When Noriega had her own kids, she was determined things would be different. She wants Luz, 8, and Paloma, 5, to grow up bilingual and bicultural. The girls, whose names mean “light” and “dove,” respectively, spend their school days learning in two languages. From the storybooks they bring home to conversations with grandparents, the Sosa-Noriega clan is speaking more Spanish now. As part of a larger effort to boost student achievement and spur integration in a district composed almost entirely of impoverished Latino students, San Antonio ISD last year rebooted a flagging middle school in a historic neighborhood as a dual language program. Mark Twain Dual Language Academy, the Noriegas’ school, now enrolls equal numbers of students from Spanish- and English-speaking households, also balanced by socioeconomic status. The seventh-largest metro area in the country, San Antonio leads the nation in economic segregation. The school’s creation is part of an ambitious plan by education leaders to confront a concentration of extreme poverty in the district, one of 17 within the city’s limits. By creating attractive schools like Mark Twain, the district is drawing in wealthy families from the city’s other school districts. At the same time, Martinez and his team have used detailed census data to identify children from the district’s poorest and most isolated neighborhoods and create a groundbreaking enrollment system that ensures they have equal access to the sought-after new programs. In addition to Twain, the district has succeeded in attracting students to diverse-by-design schools that feature Montessori, high-tech, and gifted and talented models, among others. Coupled with an ambitious plan to make sure each school enrolls a socioeconomic cross-section of the city, the effort has drawn national attention. At the end of its first year, Twain earned a state “distinction” designation for outpacing similar schools in terms of student academic growth and the rate at which socioeconomic achievement gaps were closing. The popularity of dual language schools has exploded nationwide, but the programs are particularly desired in cities near the U.S.-Mexico border, like San Antonio. Here, bilingualism is important culturally but is also a linchpin of the local economy. Demand for new dual language schools far outpaces the supply of qualified bilingual teachers. At the start of the 2018-19 school year in August, the district reopened perennially struggling Washington Irving Middle School as a dual language school starting with pre-K to second grade. In addition to the fully bilingual schools, the district offers 43 dual language programs within English-dominant schools. Also the product of a household that gradually lost its Spanish, Twain principal David Garcia is a persuasive spokesman for the “cognitive magic” of dual language schooling. A growing body of research suggests he’s right. Common wisdom has long held that teaching children in two languages would impede their academic progress. The goal has been to expose students who speak a non-English language at home — almost one-fourth of U.S. students — to as much English as possible. But increasingly, it’s clear that learning in more than one language at a very young age builds a better brain — one that’s more flexible and has more neurological connections. Research also reveals bilingualism improves the brain’s executive function, the system that governs the ability to focus, hold information in mind, and solve problems. One study found that regardless of race, ethnicity, and home language, by middle school — and sometimes sooner — North Carolina dual language students were often at least one grade level ahead of students of the same demographic in monolingual classes. The benefits are thought to be lifelong; some researchers believe bilingualism may forestall dementia. By contrast, a child whose home language is not English faces significant challenges learning to read in an English-immersion environment, Garcia notes. Not least of these is the likelihood that the words a student is being asked to decode lack cultural relevance. 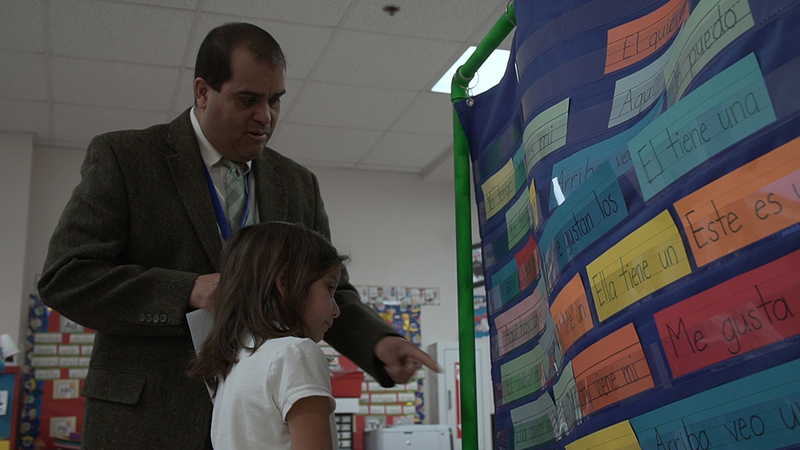 In a dual language environment, Garcia continues, all children see their language and culture validated. And because students are acquiring language from one another, both English- and Spanish-dominant children bring assets to school. Twain students spend more time learning in Spanish in the early grades, in part because it’s a much easier language to learn to read. Once someone has learned to read in one language, the skills don’t need to be taught again. As students’ comprehension and reading fluency amp up, more English-language materials are added until the kids make the shift to biliteracy. In many communities, dual language programs have fallen victim to their own popularity. Once a district has sold white families on the benefits of multilingualism, affluent parents, if allowed, pack schools and waiting lists. When a school becomes a “one-way” dual language program, meaning most or all of the students come from households that speak only one of the languages used at school, much of the benefit is lost. Conor Williams, a New America fellow and 74 contributor, has written extensively about the strategy. He knew from personal experience that waiting until a native Spanish-speaking student becomes fluent in English to begin teaching reading and math can create a gap in mastery that too often widens as a child ages. “In San Antonio, we see an amazing opportunity to help our families not only see the value of a second language, but also in taking pride in one’s culture and identity,” he says. Martinez used census data, rarely mined by school systems, to create a literal map of poverty levels throughout his new 50,000-student district. It revealed that poverty at some schools was much more profound — and thus more intractable — than at others. He hired a young hotshot to be the district’s first innovations chief. Mohammed Choudhury quickly implemented a novel system for filling the district’s attractive new schools with a mix of students. Like the district’s other “choice” schools, Twain is open to students who live anywhere in the city of San Antonio and the larger Bexar County, with seats reserved for local students from impoverished households. But San Antonio goes further, setting aside seats for families from four different income ranges within the traditional and simpler gauge of poverty: whether a household’s children qualify for free or reduced-price school lunch, a category into which virtually every San Antonio ISD student falls. In addition, at Twain, half of students must come from Spanish-dominant homes. Adjoining San Antonio’s most popular cultural attractions, the neighborhood where Twain is located is graced by impeccably restored historic homes. Built in 1923, the bright and airy school building fits right in. Even with multiple applications for each opening, at the end of the last school year there were still some unfilled seats for Spanish speakers. Which raises an interesting question about San Antonio ISD’s experiment: Will the affluent families the district is counting on to break up its concentration of poverty flock to Irving, the dual language school that just opened? A reboot of a school threatened with closure for being on the state’s “improvement required” list for too many years, Irving is located in the poorest zip code in metro San Antonio. Median family income in the 78207 is less than $25,000 a year. In several neighborhoods within the zip code, it’s half as much, and in one, only $8,000 a year. Sosa, Cristina Noriega’s now-successful dad, himself grew up in the 78207 at a time when the local high school was focused on preparing students for “jobs for Mexicans,” he says. With two applications for every seat, Irving did have a waiting list before it even opened. It didn’t draw as many middle-class families as Twain, but Choudhury, whose office oversees enrollment, did not expect it to. Like a growing number of districts, to make sure its schools are equitably enrolled, San Antonio ISD uses a single application process to match families with schools. When a parent doesn’t win the lottery at a first-choice school, this gives Choudhury’s office a chance to present other options. “Have you thought about this?” he says staff may ask. “Or, ‘Did you know that the school that you’re zoned to actually has this program?’” Sometimes the parent signs up for a tour. The schools are opening at an auspicious moment, with San Antonio’s tricentennial directing attention to the succession of ethnicities that were drawn first to its spring-fed rivers and, centuries later, to its vibrant arts scene and cultural institutions. 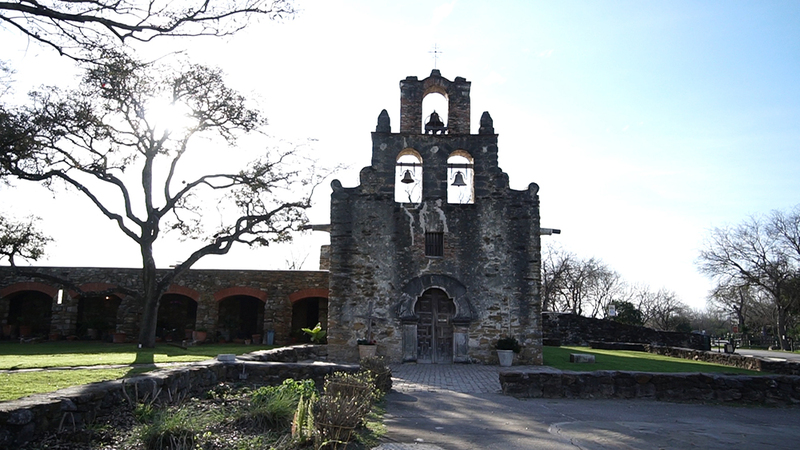 The five Spanish missions that date to the early 1700s and make up the San Antonio Missions National Historical Park were designated a UNESCO World Heritage Site in 2015. Noriega was one of four artists commissioned to paint murals alongside a greenway near one of the colonial sites. Each mural depicts native plants and animals and represents a season. Noriega lobbied to paint the winter panel, on which mountain lions prowl across a blue backdrop. She was drawn to the season because she wanted to capture another image, pecans, which grow in abundance here and which during the cold months sustained the indigenous people the Spaniards came to conquer. Despite the succession of bloody conflicts that followed, and the profound economic inequities that have persisted, San Antonio residents are proud of their multicultural roots. Noriega’s grandmother was a pecan sheller in the 1920s, a time when San Antonio provided half the nation’s supply. In 1938, 12,000 Latinas walked off their shelling jobs to protest unhealthy working conditions and injustices, including the illegal deportation of U.S. citizens of Mexican descent. As a girl, Noriega collected the nuts with her grandmother and heard about the opportunities the family’s circumstances denied her father. Sosa would go on to write the seminal book on marketing to Latinos in the United States and to advise multinational corporations and presidential candidates. But no amount of wealth and fame erased the childhood stings, says Noriega. Noriega learned Spanish as an adult, but she never crossed the threshold where her dreams move from one language to another. Her dreams for her children and her community are nevertheless fluently bicultural. Video Credits: Produced by Beth Hawkins and Heather Martino; Edited by James Fields | Disclosure: The George W. Brackenridge Foundation provided financial support for this project to The 74.